Hopefully this post can help anyone else out there who is considering a Treehouse techdegree or wants some learned lessons on how to best get through it. 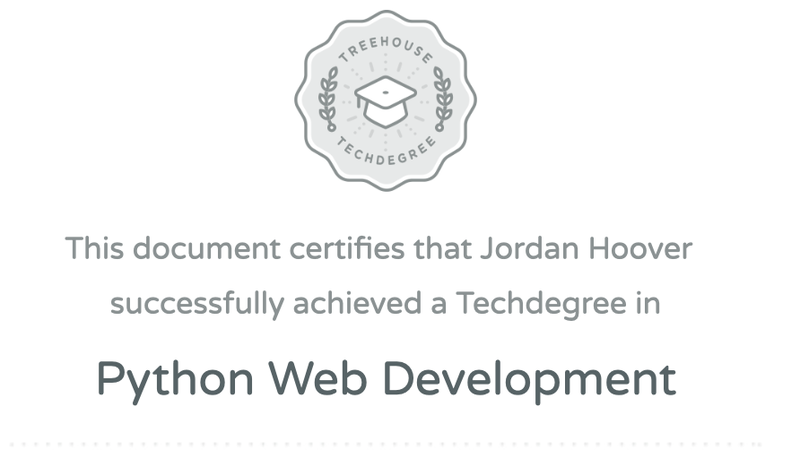 Treehouse offers several web development certifications. They all include learning videos, quizzes, instructors, a slack channel and a series of graded projects to complete. My degree was the "Python" techdegree. The meat of the degree is a series of 12 Python project that increase in complexity at each step. The later projects are focused on python web frameworks such as Django and Flask. I started the degree as a way to force myself to increase my portfolio with quality projects. I figured having graded projects with starter skeletons (especially in regards to the front end) and well written requirements would help me maintain good quality. It took me about 6 months to complete the degree, not including a 3 month break when I got the new tech job I wanted. Even though I wasn't paying the cost, at $200 a month I still wanted to complete the degree as efficiently as I could and the price hovering over my head definitely kept me motivated. Treehouse claims that the degree can be done in 3-11 months, so my 6 month completion time seems to align with their expectations pretty well. I took my time with each project and tried to make sure it had as much quality as possible, since for me I was using the degree mainly as a way to create a portfolio with standout applications for employers to look at. For me, this meant making sure to complete most of the "extra credit" requirements that were asked during the projects, adding almost full test coverage, and hosting the project. If I was just trying to breeze through the degree without these additions, it might of taken me 2 months or so less time. Secondly, I did come into the degree with a lot of tech knowledge already and as a non-newbie, I was able to leap through the first few videos and projects that were mostly focused on getting the student used to programming. In the degree's slack community, I have seen a lot of fellow students have trouble with these first 3 projects if programming is completely new to them. What's the best way to get through the degree? I'd say it depends on what your goals are. If you just want a piece of paper saying you know programming (which, I would say that is actually not very useful) then go through as quickly as possible and just meet the minimum requirements of each project. If you're just trying to learn programming, then take your time. Yes, its a lot of money, but you also needs to make sure you're getting the most of what you're putting in. So that means making sure you understand the concepts, asking questions when needed and pushing yourself on the projects. And don't be afraid to take breaks as well to let your mind digest the information. If you are worried about the cost, I would suggest dipping into other programming resources first, such as paying for the much cheaper base plan Treehouse offers. There are also tons of other resources out there to get your started and ideas for small projects to start you off are pretty easy to come by. If you get your feet wet then come back later, you'll be able power through the first few projects and get to the meat of the degree relatively quickly. Finally, if you're like me and just to have a better chance of getting a job in software (or increase your chances of getting a better job next time) then complete as many requirements as possible for each project and make sure to go above and beyond. Overall, I thought the degree was worth it and a great experience. Treehouse is one of my favorite online tech communities and has really quality videos and also knows how to impart knowledge well, which is always much easier said than done. Hopefully this was helpful to anyone in the degree or thinking about starting it. If you want to talk to me about it or have any questions, feel free to shoot me an email.